is an English actor. He has received international attention from playing Merry in Peter Jackson's adaptation of J. R. R. Tolkien's The Lord of the Rings and for his role as Charlie Pace on the television show Lost. Monaghan was born in Berlin, Germany, to British parents: Maureen, a nurse, and Austin Monaghan, a science teacher. Monaghan's family lived in Berlin, Düsseldorf, Stuttgart and Münster, moving about every four years. When he was about 11 years old, his family moved from Germany to Heaton Moor in Stockport, Greater Manchester. Monaghan's first language is English, but he also speaks some German and is well known for his ability to impersonate others and replicate accents. Bernard is his maternal grandfather's name, and Patrick his paternal grandfather's name. He chose Luke as his confirmation name after Luke Skywalker from Star Wars, his favourite film, which was also one of his inspirations for becoming an actor. He attended St Anne's Roman Catholic High School and Aquinas College, where he studied English literature, drama and geography. Although Dominic held many occupations when he was younger, he always wanted to be an actor. After his second year at St. Anne's, Monaghan became a regular in school plays such as Oliver Twist, A Christmas Carol, and Bugsy Malone before joining Manchester Youth Theatre. There, he was scouted for Hetty Wainthropp Investigates, on which he played Hetty's under-aged sidekick, Geoffrey Shawcross, for four series. He made his feature film debut as Russian sailor Sasha in TV film Hostile Waters. Monaghan later starred in the Lord of the Rings trilogy as Meriadoc Brandybuck, for which he achieved widespread fame and recognition. Monaghan narrated Ringers: Lord of the Fans, a documentary about Lord of the Rings fandom. He also provided the narration for The Discovery Channel's documentary Devil's Bible in 2008. He also appeared in Soldiers of Fortune alongside Sean Bean and Christian Slater. He was a regular cast member on the hit ABC series Lost playing a drug addict-rock star named Charlie Pace, until Charlie's death at the end of the third season. He continued to guest star on the show occasionally thereafter. 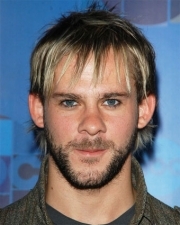 Monaghan originally auditioned for the role of Sawyer. While not landing the role, he impressed the producers. The role of Charlie was then changed from an old, washed up rocker from the 1980s, to a young one-hit wonder in order to accommodate Monaghan's age. In 2009, Monaghan starred in X-Men Origins: Wolverine. On 15 July 2009 it was confirmed that he would join the cast of ABC Studios' science fiction television series FlashForward as the character Simon. The series premiered on 24 September 2009. It was canceled after its first season. On 18 March 2010 Monaghan was spotted at the Universal Sheraton filming a short called Gloria. It was part of a program called REESES Puff's Extraordinary Cinema . He played the part of Caleb Reese. In 2010, Megan Fox and Monaghan made an appearance as a couple in an abusive relationship in the music video for rapper Eminem's song "Love the Way You Lie". Scenes include the celebrities on top of a liquor store. Fox and Monaghan also filmed inside the store and "at a seedy dive bar next door" to the store. Monaghan is a nature lover, and has been active in the planting of trees, cacti, and the pod-seeds of mature hedge-row bushes. He owns a small forest in India, and has worked with the animal rights group PETA. Monaghan has a great love for insects and reptiles that he developed during his childhood, and has kept an assortment of pets, including a leaf-mantis named Gizmo, a Black Widow spider named Witchitar and an albino snake named Blink. An avid outdoorsman, Dominic enjoys activities such as surfing, kayaking, snowboarding, football, basketball, and hiking. He has also stated that he likes hunting for insects and reptiles outdoors. He learned karate as a child, practices yoga, and often goes to the gym for strength and weight training. He is a long time supporter and fan of Manchester United. Dominic loves to play various games, and has hosted game nights for fellow cast members in the past. He is also fond of working the New York Times crossword puzzle. On his right arm he has a tattoo of the Elvish word "nine" written in Quenya-mode Tengwar, a reference to his involvement in the Lord of the Rings and the fact that his character was one of the nine members of the Fellowship of the Ring. Seven other cast members and one of the stunt doubles (John Rhys-Davies' stunt double) also got matching tattoos during the film's production, at Dominic's instigation. Below that tattoo is another that reads, "Life imitates art", an Oscar Wilde quote. On his left arm is a tattoo, "Living is easy with eyes closed", a line from The Beatles' "Strawberry Fields Forever". He also has two stars tattooed on his left foot, one black, and one white. In 2010, Monaghan got two more tattoos, one on the upper side of the back ("Love you take is equal to the love you make", taken from the song "The End" by The Beatles). The other, done by Kat Von D on the television show LA Ink, is located on his lower right arm ("Luminous beings are we, not this crude matter", a quote from Yoda). He resides in the Los Angeles, California area. In 2008 Monaghan held a photographic exhibit in Los Angeles in which he sold prints of his own works. A portion of the proceeds from the exhibit were given to an orangutan rescue organization. Past relationships include his Lost co-star Evangeline Lilly from 2004 to 2009. In June 2008 Monaghan traveled to Argentina with Lilly to film the pilot of the American version of CQC, . He has long been working on a script with LOTR co-star and good friend Billy Boyd. Dominic provided the inspiration for the naming of Boyd's band Beecake after he sent his friend a picture of a cake covered in bees. Whole or part of the information contained in this card come from the Wikipedia article "Dominic Monaghan", licensed under CC-BY-SA full list of contributors here.